Much of the history of the City of Sturgeon Bay has been shaped by the comings and goings of all manner of ships and boats. The marine propeller played an important role as these vessels transitioned from sail to steam as their primary means of propulsion. Propellers continue to be an essential component in the propulsion system of most ships and boats plying the Great Lakes today. A propeller is essentially a type of fan that transmits power by converting rotational motion into thrust. A pressure difference between the forward and rear surfaces of the blade create thrust as water is accelerated behind the propeller. A marine propeller is commonly referred to as a screw propeller or screw. by The Interlake Steamship Company, owner and operator of the Oberstar. The smaller propeller to your right is cast from bronze as a single piece. This propeller is from the "bow-thruster" of U.S. Coast Guard barge CGB-12002. A "thruster" is a small propulsion propeller specially designed to push a vessel from side to side. Rather than being at the rear of the vessel, these smaller propellers are typically located in a tube-like structure built into the hull facing the side of the vessel. 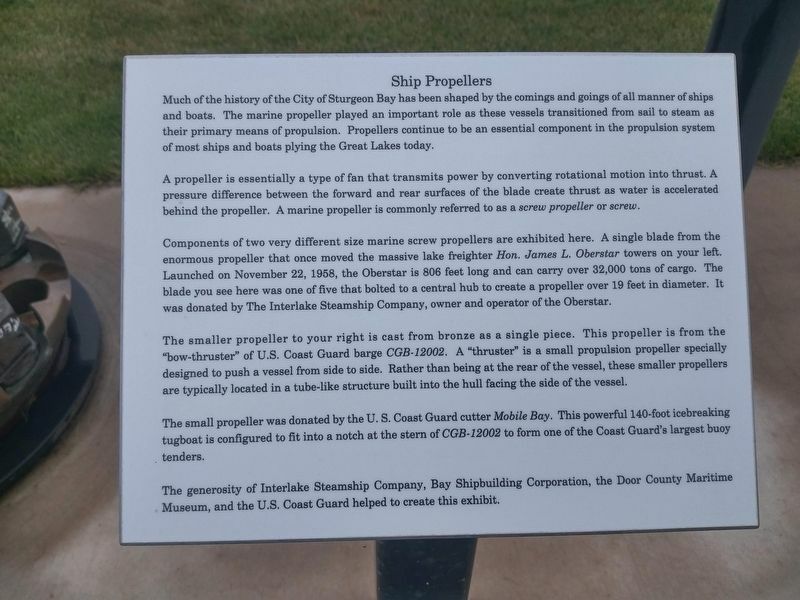 The small propeller was donated by the U.S. Coast Guard cutter Mobile Bay. This powerful 140-foot icebreaking tugboat is configured to fit into a notch at the stern of CGB-12002 to form one of the Coast Guard's largest buoy tenders. 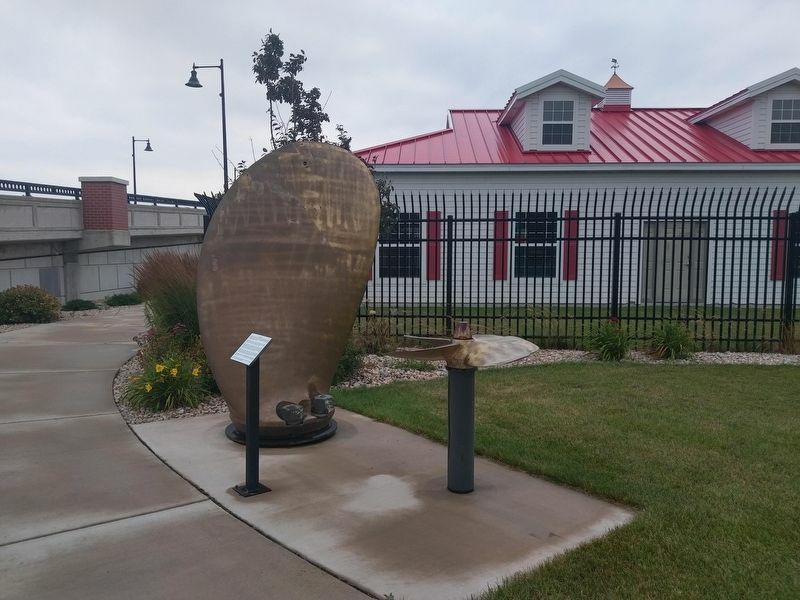 The generosity of Interlake Steamship Company, Bay Shipbuilding Corporation, the Door County Maritime Museum, and the U.S. Coast Guard helped to create this exhibit. Location. 44° 49.747′ N, 87° 22.889′ W. Marker is in Sturgeon Bay, Wisconsin, in Door County. Marker is on West Maple Street. Touch for map. Marker is at or near this postal address: Sawyer Park, S. Neenah Ave., Sturgeon Bay WI 54235, United States of America. Touch for directions. Other nearby markers. At least 8 other markers are within walking distance of this marker. Sturgeon Bay's Waterfront History (a few steps from this marker); The Fluke Anchor (within shouting distance of this marker); a different marker also named Sturgeon Bay's Waterfront History (within shouting distance of this marker); a different marker also named Sturgeon Bay's Waterfront History (within shouting distance of this marker); a different marker also named Sturgeon Bay's Waterfront History (within shouting distance of this marker); a different marker also named Sturgeon Bay's Waterfront History (within shouting distance of this marker); a different marker also named Sturgeon Bay's Waterfront History (about 300 feet away, measured in a direct line); Buoy and Sinker (about 300 feet away). Touch for a list and map of all markers in Sturgeon Bay. More. Search the internet for Ship Propellers. Credits. This page was last revised on March 28, 2019. This page originally submitted on March 26, 2019, by Devon Polzar of Port Washington, Wisconsin. This page has been viewed 87 times since then. Photos: 1, 2. submitted on March 26, 2019, by Devon Polzar of Port Washington, Wisconsin. • Bill Pfingsten was the editor who published this page.